Stephanie Schuttler is a mammalogist with strong interests in animal behavior, molecular, and movement ecology, especially applied research that impacts the conservation of threatened and endangered species. 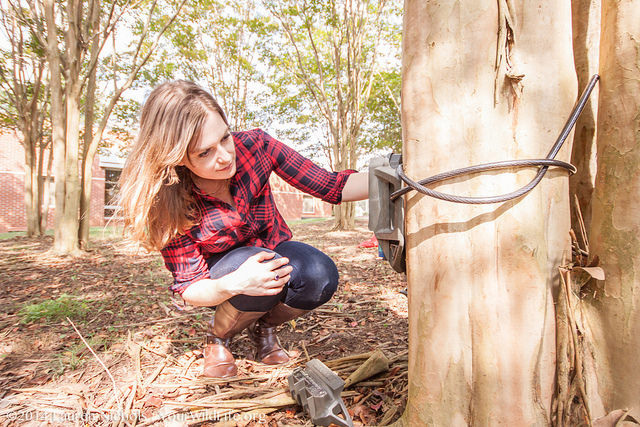 She is working with NC teachers under the Students Discover program to implement eMammal, a citizen science camera-trapping program, into the curriculum of middle school classrooms and will use the student-collected data to study urban mammals. She also studies social behavior in mammals, specifically the social structure of elusive African forest elephants (Loxodonta cyclotis), and the flexible system of common raccoons (Procyon lotor). She is passionate about science communication, and actively tweets and blogs about wildlife conservation issues and science. Schuttler, S. G., K. Jeffery, A. Whittaker, and L. S. Eggert. 2014. Social network analyses reveal limited fission-fusion sociality in African forest elephants. Endangered Species Research 25: 165-173. Schuttler S. G., Philbrick J. A., Jeffery K. J., Eggert L. S. 2014. Fine-scale genetic structure and cryptic associations reveal evidence of kin-based sociality in the African forest elephant. PLoS ONE 9: e88074. Schuttler, S. G., S. Blake, L. S. Eggert. 2012. Movement patterns and spatial relationships among female African forest elephants. Biotropica 44: 445-448. Fox 8 Feb 24, 2017 – Features the research of Stephanie Schuttler. CBS North Carolina Oct 29, 2016 – Features the research of Stephanie Schuttler. How Far Do Your Cats Roam? National Geographic August 7, 2014 – Features the research of Roland Kays et al. Discover July 25, 2014 – Features the research of Roland Kays et al.